Level Water, a charity providing swimming lessons for disabled children, partnered with the OSS Dart10k this year, raising a phenomenal £45,000. Here’s how they are changing lives. Level Water is a new and fast-growing charity which provides one-to-one swimming lessons for disabled children. It currently operates in 30 cities and at 40 pools, teaching 400 children a week. For the first time this year, Level Water was a charity partner at the OSS Dart 10k. 130 swimmers chose to fundraise for the charity, between them raising £45,000, which will allow them to open in another 10 sites and teach 100 new children. Here the charity’s director, Ian Thwaites, explains how why providing one to one swimming lessons is important. Without one-to-one swimming lessons, most disabled children will never learn to swim. Group lessons are either unsafe or ineffective for disabled children. Most of them cannot successfully group lessons at their local pool and so will never learn to swim independently. Over time, most disabled people will lose the confidence to be in and around the water. They won’t be able to take part in group or school activities with their friends. They won’t be safe by rivers, lakes, pools or the ocean. They won’t have access to other water sports and leisure. Level Water finds children who aren’t able to access group lessons, and gives them free one-to-one lessons until they can swim 15m frontcrawl and backstroke – this is usually around one year of lessons. At that point, they are physically independent in the water and have basic skills. We help them to re-join a group class and continue to learn at their own speed. Level Water helps to make that group lesson a success and encourages children to go on to competitive swimming clubs if they wish to. Learning to swim creates three big changes for a child. Firstly, water is a fabulous medium for disabilities. 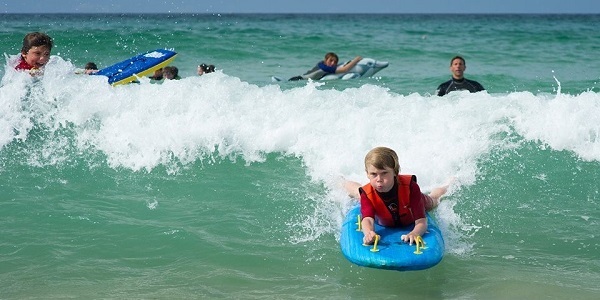 It’s a real equaliser, and many of our children say they don’t feel disabled in the water. The weightlessness relieves pain, and many families report that our lessons also have a positive effect on physiotherapy, particularly helping children with mobility, strength and balance. Secondly, it gives them all the personal and developmental tools that sport teaches. They are socially included in group lessons. Their self-esteem grows as they are continually set and overcome new challenges. Their confidence grows as they find they can succeed and become competent in a new environment (parents report and increase of 30% in self-esteem and confidence during our lessons). Many of these children will face repeated barriers due to their disbailities; by increasing their physical, social and emotional confidence we can change their trajectory in life. So what difference has the Dart 10k made to Level Water? It is hard to over-emphasise how much this event has helped the charity. We currently teach lessons in 30 towns and to 300 children each week. The Dart fundraising will directly pay for another 100 disabled children to learn to swim this year, and has given us the confidence to double our size over the next 18 months. Level Water currently has good coverage in the South and Midlands, but by the end of this period we will be a truly national charity. Dart 10k has come at a perfect tipping point for us, as the charity is taking on a momentum of its own; it feels that we are moving out of our “start-up” phase, and are now recognised as the largest swimming charity in the country. Our very biggest “thank you” to everyone who fundraised for us at the swim, to everyone who came to say hello to us at the end and not least to our great friends at the Outdoor Swimming Society for inviting us to become a part of such an amazing community. 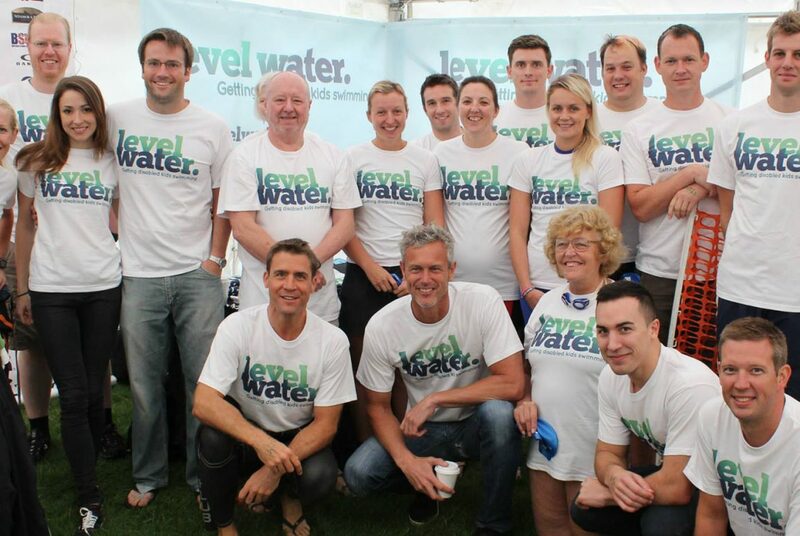 Level Water will be back at the Dart10k in 2017 – and may be joining us at other events. If you would like to get in touch with Level Water, you can contact us on: Ian Thwaites (Director) ian@levelwater.org. Collette McCarthy (Projects and Fundraising) colette@levelwater.org. To swim for Level Water at OSS events, wait until the events are launched for 2017 and then follow the links to our charity places.